We’re grateful to everyone who joined us on Friday 25th January for a planting at Gibson Island (Murarrie). We had a variety of local industry representatives there (including QBH, Visy, Port of Brisbane, Incitec Pivot, Powerlink, Energex & New Hope) as well as local community members. Thanks also to Di Farmer MP and Joan Pease MP for participating. A total of 56 people joined in! The planting activity was made possible thanks to recent funding provided by the Pratt Foundation and support from Visy. Read more about their support here. There has been, and will continue to be, much ongoing maintenance work there, especially in this continued hot and dry weather. We’re now at a total of 3,346 natives planted for the Gibson Island Rehabilitation Project. Friday’s greening action also provided a great launch event and cheque handover for our projects with Queensland Bulk Handling (QBH). 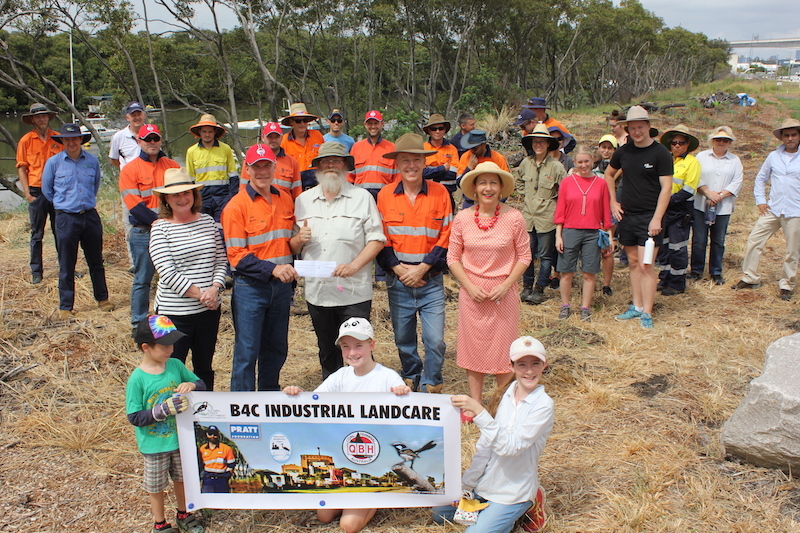 QBH and B4C will work together in a revegetation drive that will focus on greening industrial areas along the Brisbane River. 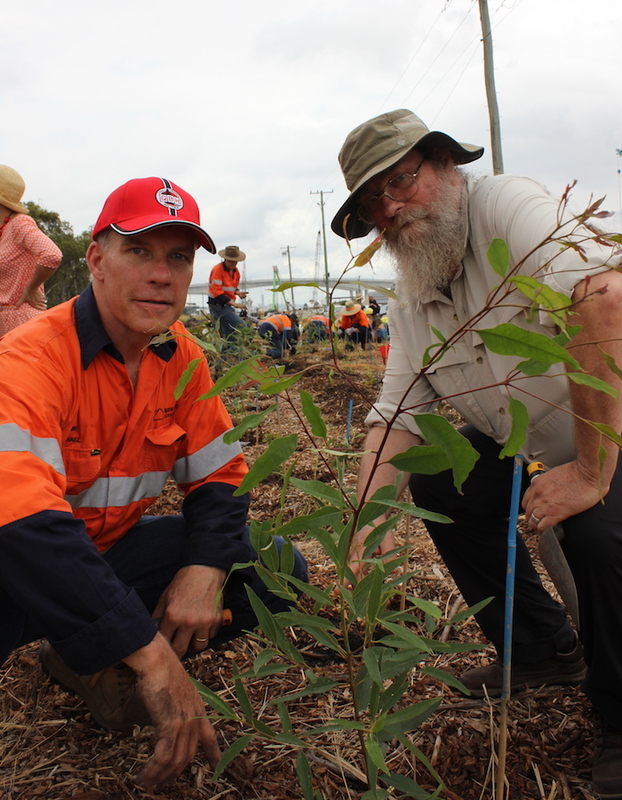 At the Gibson Island planting, QBH’s Acting General Manager, Michael Raff said the planting event offered a glimpse into the rehabilitation work that will be expanded over the coming 12-18 months. “The alliance between QBH, Brisbane’s leading coal export terminal, and one of our most experienced environmental conservation groups is an obvious one and reflects our real enthusiasm for responsible environmental management,” Michael said. “We all work and play on the banks of the Brisbane River, and love it here. We want to ensure we protect the area’s flora and fauna for generations to come. “Joining forces with B4C, who have a proven track record of protecting, restoring and monitoring plant life and wildlife in and around Brisbane’s waterways was an obvious choice. Starting this month, B4C will begin preparing for revegetation of QBH’s 11 hectare site in the Port of Brisbane, bringing in more native species and creating improved pathways for native fauna. “This process will take approximately 18 months, after which B4C will continue to maintain the site on a contract basis,” Michael said. B4C President Mik Petter (pictured, right, with QBH’s Michael Raff, left) said he applauds the supporters of the B4C Industrial Landcare program. “Environment is everyone’s business and every business can help the environment,” Mik said. B4C’s Catchment Manager, Wayne Cameron, said rehabilitation projects, like the one on Gibson Island, demonstrate the benefit of industry cooperation. “Estuarine systems are important to our city and economy, but also our environment, natural resources, and wildlife. They are one of the most important areas to show that industry and nature can exist together,” Wayne said.